I just wanted to take a minute to tell you just how wonderful you folks are and also give you the full story of my experience with baby furniture shopping I mentioned to you when I was in last week. About 2 years ago my wife was pregnant with our second child and I was determined not to make the same mistake buying her furniture that we did with the first one.The first time around we took the advice of a friend who worked at one of the “big box” stores and ordered furniture “on a great deal” out of their catalog on her recommendation. What a mistake that was. Absolute junk. Particle board with wood grain verneer. At the time I began to shop for my second child’s furniture, my oldest daughter was now 5 years old, very rarely was ever in her room and the furniture was already falling apart. I have spent the past 2 years adding my own lag bolts and liquid nails to keep it in a situation that I consider safe. She is now 7 years old and her furniture is about ready for the burn pit. As a factory sales rep that travels 14 states I was positive I could find good quality baby furniture at a decent price. Over the course of 4 months, I was literally in over 200 baby stores in PA, OH, WV, MD, VA, NC and SC, I even went into several different areas of Amish Country. Every store fit into one of 3 catagories. Cheap junk, extremely overpriced mediocre stuff or outrageously priced good quality. I found people who were unwilling to help, people who had no idea what they were selling and people who actually became offended when I asked to remove a drawer to examine the quality of the construction of their furniture. That is, until I walked into Baby Tyme. I immediately realized I had not seen the brands of furniture you carried in any other store I had been in. After walking around for a few minutes I came upon a set that I liked. I began to look it over closely and liked what I saw. At that point John came over and asked if I needed any help. I explained my predicament briefly to him and he told me, in detail, about the construction of the furniture I was looking at, all the while opening drawers and doors to show me examples of what he was talking about. When I asked him if I could take out a drawer to examine the quality a little further. Rather than getting offended, he explained that the drawers had a “safety memory” and explained the proper procedure to remove the drawer, then helped me remove it. I was truly impressed, and I don’t get impressed very easily. 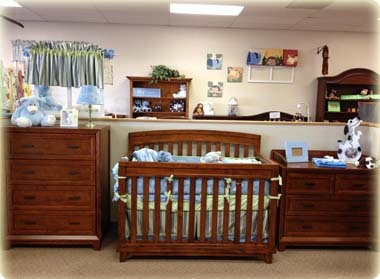 Both sets we were looking at were Westwood brand and I can honestly say they were the highest quality of any baby furniture I had seen anywhere. Even better quality than sets I had seen imported from eastern Europe at high end boutiques that cost 4-5 times more! At that point I was sold, the only problem was I was debating between 2 different similar sets, my wife was not with me and I live nearly 3 hours away east of Pittsburgh, PA. John gave me spec sheets on both styles I was comparing along with pricing for me to take home to review with my wife. He made no attempt to pressure me into a purchase, even though he probably could have had he wanted to. Instead he quoted me out exactly what we had discussed, put in writing and said to give him a call when we made a decision. The next day, my wife and I made a decision and I called the store to order the set from John and give him a credit card deposit over the phone. The only problem was that John was not in. I forget if I spoke with Joe or Steve but what I do remember was that John and I had agreed to a few points that are probably out of the norm for your store and with him not there I figured I was not going to be able to place my order until John was back in the store. Not the case at all. I explained what John and I had discussed and was told, no problem at all and my order was taken without incident. A short time later I recieved a call that my furniture had arrived and I could pick it up whenever I wanted. I rented a trailer and headed for Hartsville. My fear now was that I would get this great furniture home and it would be damaged. Boy was I wrong. I have never in all my years seen a product so well packaged. I thoroughly inspected each and every piece after unpacking it and…..not a single scratch! And I can tell you I wasn’t exactly as gentle as I would have liked to have been taking it up the stairs of my house to the 2nd floor. Needless to say, the end of last year when my wife became pregnant again, I didnt hesitate. I packed her in the car and we took a Saturday and drove out to Baby Tyme. We ended up wanting to mix and match one crib with another dresser and hutch set. Once again, no problem at all and just as importantly, no “special order” charges and no BS. This time, when I picked up my set I noticed quite a lot of shipping “damage” to the crib box. I didn’t think much of it since I remembered vividly just how well packaged my last set was. Sure enough this time there was some minor damage to the head board of the crib. This is where inferior companies fail. Anyone can sell a product but very few seem to want to back their products these days. Not the case with Baby Tyme. I called the store and got Joe on the phone and explained the situation. Once again, the response was “no problem, we will take care of it”, in fact he said that several times. He needed the serial number and build date of the crib so he could be sure to get me the exact right piece, I didn’t have it handy so I told him I would call in with it in the morning. He explained he would not be working but Steve would be in and he would fill Steve in on the situation. Sure enough, when I called in the next morning and spoke to Steve, he knew exactly what was going on and reiterated several times “no problem, we will take care of it”. I gave him the numbers and he said he would call me when the new headboard was in and we worked out that since I travel to Ohio all the time I could stop in and swap it out at my convenience. A very happy and easy resolution to a potentially big headache. But it didn’t stop there. The very next day I received another call from Steve. It seems he had a matching crib in stock and I could swap out the headboard immediately. I don’t often deal with a company that is willing to tie up their inventory waiting for a replacement part, just to make a customer happy. Especially one that wasn’t unhappy to begin with and was perfectly ok with waiting for the replacement. I know this has been very long winded but I think the whole story speaks volumes more than just a few tidbits of information ever could. I don’t know how many, if any, of my friends or acquaintances have been in or looked at your website to buy, but I can tell you that I hand your business card to every person I meet that is having a baby. I tell them about my experience and I show them my furniture. Every single person who has seen my children’s furniture and/or heard my story has simply responded with “WOW”. If anyone is not willing to drive to Hartsville to experience all that Baby Tyme has to offer then they paid too much and didn’t get enough! And they don’t realize all the incredible baby items you have that they haven’t seen anywhere else.